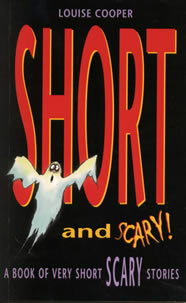 A cautionary tale from SHORT AND SCARY! I hate my baby brother. Ever since Mum brought him home from hospital, she and Dad haven't had any time for me. It's all 'Look at the baby', 'Let's play with the baby', and 'Not now, we're looking after the baby'. They think he's sweet. But all he does is yell and throw up and have to have his nappy changed every five minutes. I hate him. So I'm going to get rid of him. I've worked out how to do it. I got the idea from a story in the fairy book Nan gave me for my birthday. In the story, this couple find a fairy ring—you know, a place where toadstools grow in a circle in the grass—and they dance there. That makes the fairies angry, so they steal the couple's baby and put a fairy child in its place. The parents never know what's happened. Well, I know where there's a fairy ring. And I'm going to go and dance there. A fairy child would be much more fun than my horrible baby brother. I'm at the fairy ring now. I'm dancing. There's no one here to see me. I've made up a song, asking the fairies to come and take my brother away. Right. That's done. All I've got to do is wait. Now I'm in bed. It's very late but I'm not sleepy. I'm listening for the fairies. I'm sure they'll come. And in the morning, no more baby brother. Wait a minute. My door's opening. A crowd of tiny people are coming into my room. They've got wings. They're scowling at me. They look furious. No—no, hang on; it's him you want! Let go of my arms! Ow! Help! You're not supposed to do this, there's been a terrible mistake! You're supposed to take my brother!